An albatross in all its majesty. Credit: Birding New Zealand. Albatrosses have for centuries been a subject of marvel for poets and scientists alike. In The Flowers Of Evil, Charles Baudelaire’s description of their clumsy gait when trapped on ship decks only served to underline, by contrast, the majesty of those giants of the skies when they navigate the legendary southern ocean storms. Albatrosses, the birds with the longest wings on the planet, glide the world’s oceans with grace and mastery for thousands of miles at a time. They cross those huge distances without the need to even flap their wings! For many other migrating birds, flying is an extremely energy intensive endeavour that is evidenced by the rapid acceleration of their hearts during flight and an impressive loss of weight (up to 50%!) during long-distance travel. By contrast, the heartbeat of a gliding albatross hardly increases at all. To accomplish this feat, albatrosses fly in a very specific, S-shaped trajectory that allows them to subjugate and literally ride the winds. Their particular flight pattern is such a wonder that, in 2012, scientists put GPS sensors on an albatross and monitored its journey that departed from the Kerguelen Islands in the southern Indian Ocean. 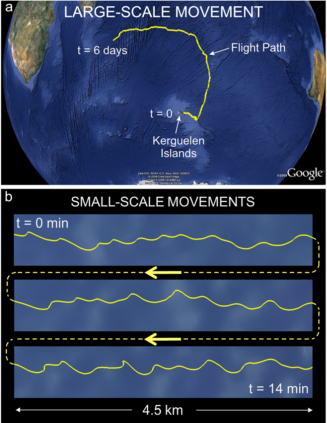 In six days, the albatross travelled for 5,000 km in a succession of 15 second long “S” maneuvers forming a long zigzag. The monitored albatross’s trajectory, traveling over the Indian Ocean. Credit: Sachs et al. Basic scaling laws of mass and muscle power density predict that large, heavy birds are not able to sustain prolonged flights by flapping their wings. Instead, they have to harvest energy from external sources such as the wind. The albatross’s gliding, almost magical, is therefore closely related to its size. Flight strategy and shape are tightly interconnected. Some continental gliding birds (birds that fly across land), such as the condor and the eagle, employ a strategy called slope soaring (soaring is synomymous with gliding). They look for regions of rising air, often located on the wind side of mountain slopes and fly in circles in those ascending currents to be transported in altitude, gaining potential energy. 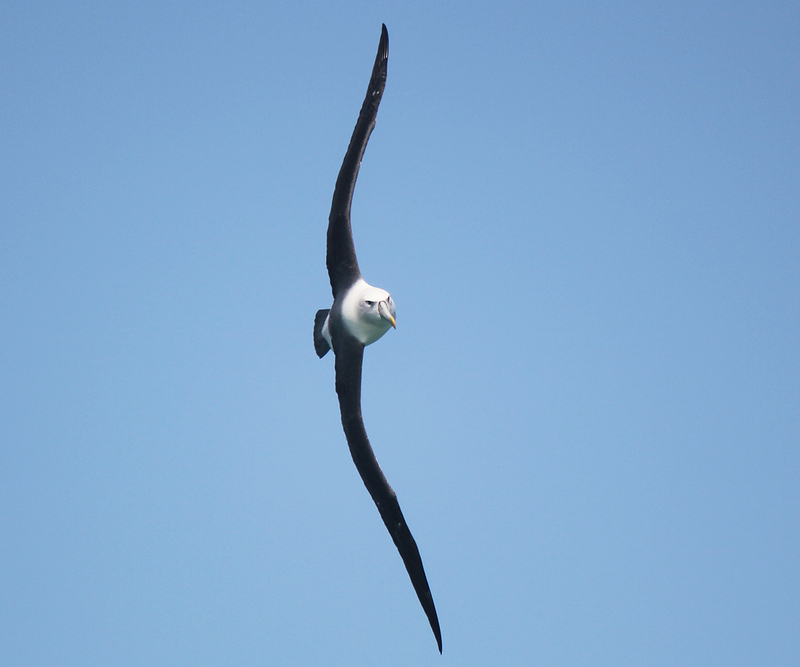 The current understanding is that, by contrast, marine gliders such as the albatross don’t have the luxury to leverage upwards air currents as they ride flat, uniform landscapes. They still use winds to fuel their flight, but in a manner reminiscent of how a sailboat leverages wind energy. a) A sailboat and the albatross’s trajectory. b) Horizontal cross section of the sail or albatross’s wing in the high altitude section of its trajectory c) Horizontal cross section of the sailboat keel or albatross’s wing in the low altitude section of its trajectory. Consider a sailboat traveling crosswind (perpendicular to the wind). It can be decomposed into two functional elements: 1- the sail, similar to a wing extending upwards, and 2- the hull and its keel, similar to a wing penetrating down into the water. 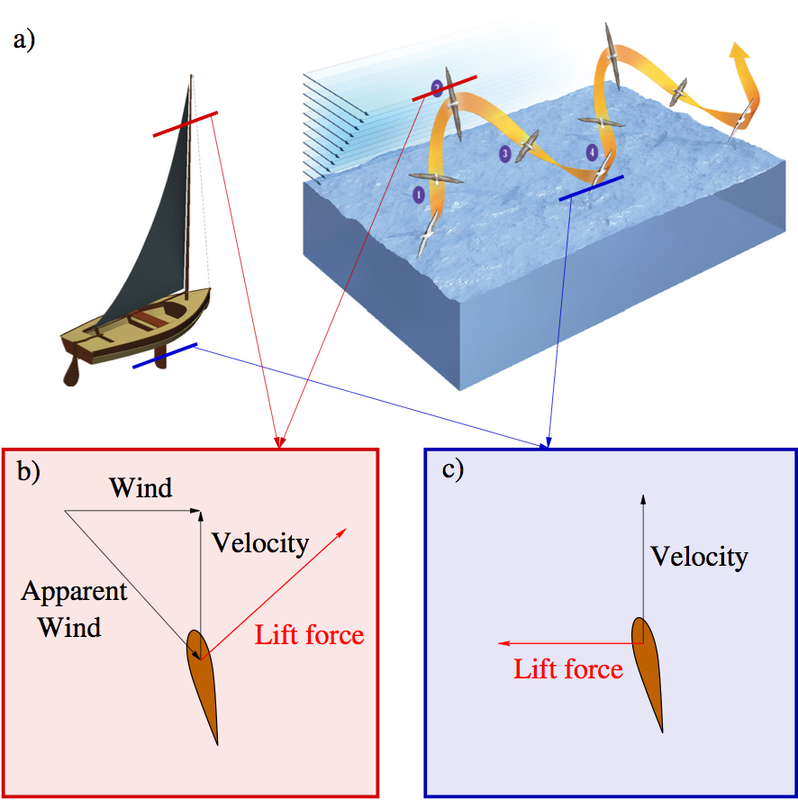 The main force acting on the sail is a lift force perpendicular to the apparent wind (there is also a drag force, but for wings it is typically 50 times smaller than lift, as presented on NASA’s website), that pulls the boat forward and downwind (part b of the figure on the right). The keel’s lift force balances the downwind force from the sail and maintains the boat on a crosswind trajectory (part c of the figure on the right). The essence of the boat’s movement is that air and water travel at different speeds. The ship utilizes these differences to propel itself forward. It extracts energy by transferring momentum from the moving air to the still water. If there were no difference in speed between air and water, no sailboat could sail. Everything would move in unison and from the sailor’s standpoint, it would look like a windless, calm day with nothing else to do other than to fish and play a game of cards. Let’s now return to the albatross’s flight. Although the wind over oceans is largely horizontal (making slope soaring infeasible), it is not uniform. Very close to the water, a boundary layer develops, where the wind is significantly slowed down by the friction with the ocean’s surface. Just as the sailboat can take advantage of a difference in speed between the wind and the water, the albatross takes advantage of a difference in speed between wind close to sea (slow layer) and wind well above (fast layer). Unlike the sailboat, however, the albatross is too small to interact with both regions at the same time. Therefore, it zigzags between the two layers, its whole body playing alternatively the role of the sail and that of the keel. For the first half of the S pattern, where the albatross is pointing its belly towards the wind, it climbs up into the fast layer. There, a strong lift force transfers kinetic energy to the albatross by pulling it forward and downwind (part b of the figure), just like the wind would act on a sail. For the second half of the S, the albatross orients its belly downwind and dives to the relatively calm boundary layer, tracing out a semi-circle that lets it recover its upwind orientation. In this second phase, the lift force pulls the bird upwind (part c of the figure) and compensates for the windward force that was applied over the first half cycle – just as a sailboat keel’s provides a reaction force. This flight pattern is known as dynamic soaring – dynamic because the bird constantly moves to soar in winds at different speeds. How fast can albatrosses fly? Simple dynamic soaring theories predict that velocities of up to 10 times the wind speed can be achieved. Radio controlled plane enthusiasts built carbon fiber gliders reminiscent of the albatross and claim to have performed dynamic soaring at the impressive speed of 498 mph in 50 mph winds. Albatrosses are not strong enough to sustain the tremendous accelerations that come with such high speed and they adapt their flight pattern accordingly. They have been recorded gliding at more modest speeds of 70mph. The oceans constitute an essential part of our lives on Earth, be it for their influence on the weather and climate, on food, goods and energy production, CO2 absorption, transportation and trade, or leisure and contemplation. It is therefore of uttermost importance for us to be able to explore, understand and monitor them carefully. Albatrosses might very well be the best ocean travellers of all time and so studying and reproducing their flight appears a promising way for us to delve deeper into understanding the ocean world. Gabriel Bousquet is a 2010 fellow of the Fulbright Science and Technology Award Program, from France, and a PhD candidate in the Department of Mechanical Engineering at the Massachusetts Institute of Technology.